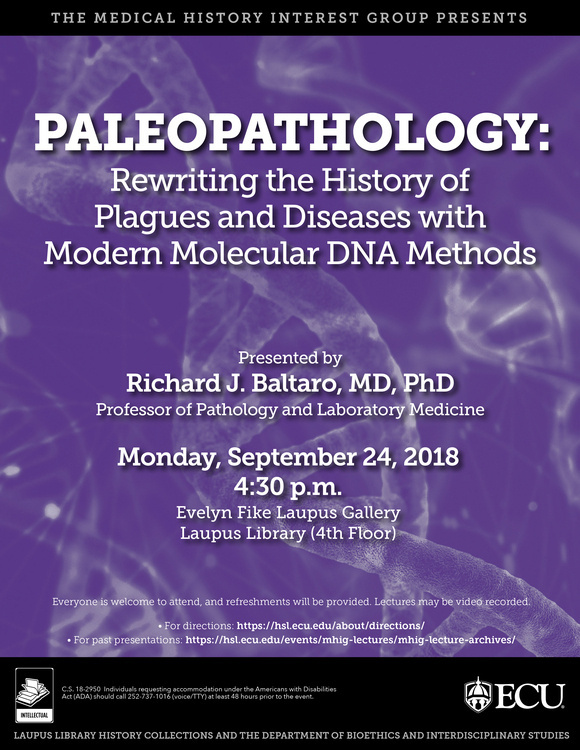 The Medical History Interest Group invites you to attend "Paleopathology: Rewriting the History of Plagues and Diseases with Modern Molecular DNA Methods" presented by Richard J. Baltaro, MD, PhD, Professor of Pathology and Laboratory Medicine. Molecular biology has been used as a tool of paleopathology over the last few decades, as DNA can be recovered from human remains that are hundreds of years old. Since techniques such as PCR are highly sensitive to contamination, meticulous laboratory set-ups and protocols are necessary to ensure that false positive results from other materials in the laboratory do not occur. For example, the long-held assumption that bubonic plague was the cause of the Plague of Justinian and the Black Death has been strongly supported by finding Yersinia pestis DNA in mass graves, whereas another proposed cause, anthrax, was not found. As with many Italians, Baltaro developed an interest in the history and history of medicine in Rome, Italy, before immigrating to the United States. Baltaro lived near the Colosseum on one of the original seven hills of Rome. While Roman mythology dates the founding of Rome to April 21, 753 BC, the site has been inhabited for 28 centuries, making it one of the oldest continuously occupied sites in Europe. Since 1995, Baltaro has been a member of the international groups Paleopathology Club and History of Pathology Society. Pathologies, abnormalities in biologic individuals and systems, may be intrinsic to the system itself (examples: autoimmune disorders or traumatic arthritis) or caused by an extrinsic factor (examples: viruses or lead poisoning from pipes). Paleopathology, the study of ancient diseases, is an interdisciplinary science. This event is a Wellness Passport event.